In 1965, a college education was no longer a get-out-of-jail free card for the Vietnam War. At the outbreak of the Vietnam War, Harvard students were safe from the draft. College undergraduate and graduate students were automatically awarded draft status 2-S–deferment for postsecondary education–and could not be forced to serve. For those opposed to the war, it was a get-out-of-jail-free card. The war in Vietnam was escalating, and the U.S. army found itself in need of more recruits. In fact, by the fall of 1965, the U.S. Defense Department would order the highest enlistment quotas since the pinnacle of the Korean War: 27,400 men in September, and 33,600 in October. These thousands weren’t selected at random. Instead, the Selective Service System (SSS) instituted a system of academic evaluation under which local draft boards would defer students based on intellectual ability. This ability was determined by two factors: class rank, and score on a national aptitude test known as the Selective Service Qualification Test. Undergraduates with a high class rank, or a test score above a certain cutoff, were draft-exempt. Everyone else could be sent to the front. Harvard responded warily to the SSS decision to use class rank to determine draft status. Harvard had not previously ranked its students, and many students and faculty worried that rankings would foster “grade-grubbing” and prevent academic risk-taking. "Are [professors] willing (and able) to function professionally in a situation wherein they hold life-and-death probability powers over their students?" Sociology Department chair John R. Seeley asked in a 1966 memo. “We might refuse to be professors under such an invasion or misuse of our role. We might cease to grade at all (except privately for information for each student) or we might grade every one equally high." An October 1966 referendum showed that 72 percent of the Harvard undergraduate respondents felt that Selective Service should not use class rank to determine 2-S deferment. Harvard administrators, too, were concerned. In an effort to standardize grading and make draft designation “fairer,” then-President Nathan M. Pusey ’28 and then-Dean of the College John U. Munro ’34 suggested a solution: adopt the aptitude test already in use at schools across the country. The test, officially called the Selective Service Qualification Test, and colloquially known as the “Vietnam exam,” was scored out of 150 points. Undergraduates needed to score at least 70 points to secure draft exemption, and graduates needed to score 80. The first sessions were administered on Harvard’s campus in the spring of 1966. As much as Harvard students disapproved of class rankings as a determinant of draft exemption, they liked the Vietnam exam even less. According to the 1966 referendum, a vast majority of students surveyed–90 percent, in fact–felt that the exam should not be the sole means of draft selection. 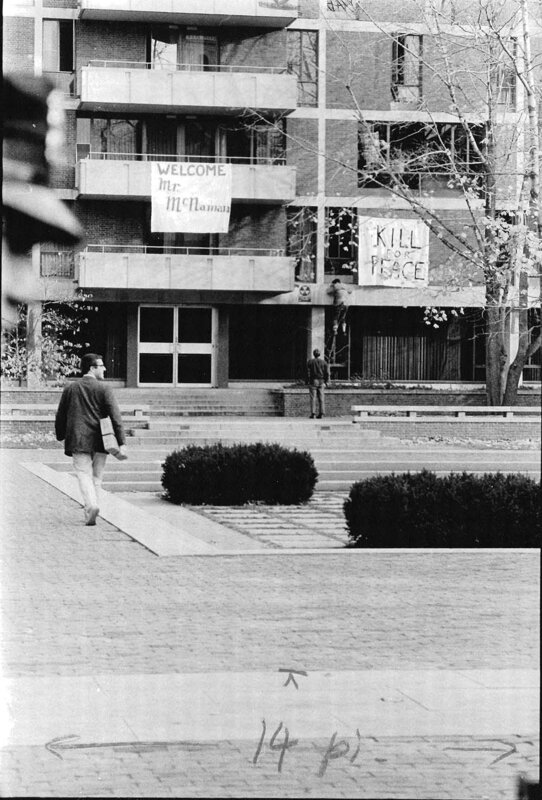 By the 1965-1966 academic year, growing anti-war sentiment had resulted in the emergence of several large movements on or near campus, including the Boston Draft Resistance Group, “The Resistance,” and the Harvard-Radcliffe branch of Students for a Democratic Society (SDS). Initially, SDS had lacked a strong anti-draft program. Its primary membership was students, after all, a population which had been draft-exempt until 1965. This changed after the erosion of the 2-S deferment. Galvanized by this new vulnerability and seeking to consolidate its place as the leading anti-war organization in the country, SDS staged a national protest against the exam. The protest was based on a “counter-exam”–a four-page leaflet printed 500,000 times and distributed by SDS members stationed outside 850 examination centers across the country. The protest took place on May 14, 1966, the date of the very first Vietnam exam. “Some of it was straight education. Some of it was a little funny. Some of it was clearly pointed and polemical. We were just trying to make a point,” Michael S. Ansara ’68, regional coordinator of SDS during the administration of the counter-exam, said. Organizers perceived the effort as a success. “This exam put SDS on the map around the country,”John F. Maher Jr. ’60, New England coordinator of SDS, said. Other Harvard students were reluctant to protest the Vietnam exam. Under a system of draft deferments based on class rank within schools, Harvard students were competing with one another. Under a system based on a national test, they were competing with students from universities and colleges across the nation. Students at top-ranked schools often found themselves better prepared for the exam than their peers at less well-resourced schools. For many Harvard students, the Vietnam exam offered a distinct advantage in the competition for draft deferrals. Perhaps for this reason, neither popular discontent nor the catalyst of the counter-exam led to immediate change. “It didn’t stop any college from participating. It didn’t stop any dean from doing the rankings,” Ansara said. Harvard would continue to submit class rank and test score information to the SSS, and students would–apart from occasional protests–for the most part acquiesce. Anti-draft organizers were aware of the counter-exam’s shortcomings. “This [counter] exam was a great idea. It got a lot of students involved,” Maher said. “But it didn’t do anything to reach the working class, who were the ones who were under the gun the most from the draft. —Staff writer Laura E. Hatt can be reached at laura.hatt@thecrimson.com.